Designed to double the number of cycles you can fit in a relatively small space, with 2 rows of bike parking. 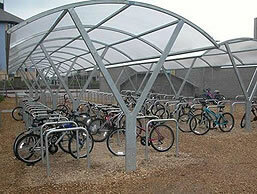 Shelter available in a galvanised or powder coated RAL code colour finish with galvanised cycle stand toastrack. Anti-climb roof and end frames with 5mm polycarbonate panels on the roof.